You can use AWS DMS to migrate data to an Amazon DynamoDB table. Amazon DynamoDB is a fully managed NoSQL database service that provides fast and predictable performance with seamless scalability. AWS DMS supports using a relational database or MongoDB as a source. In DynamoDB, tables, items, and attributes are the core components that you work with. A table is a collection of items, and each item is a collection of attributes. DynamoDB uses primary keys, called partition keys, to uniquely identify each item in a table. You can also use keys and secondary indexes to provide more querying flexibility. You use object mapping to migrate your data from a source database to a target DynamoDB table. Object mapping lets you determine where the source data is located in the target. When AWS DMS creates tables on an Amazon DynamoDB target endpoint, it creates as many tables as in the source database endpoint. AWS DMS also sets several Amazon DynamoDB parameter values. The cost for the table creation depends on the amount of data and the number of tables to be migrated. When AWS DMS sets Amazon DynamoDB parameter values for a migration task, the default Read Capacity Units (RCU) parameter value is set to 200. The default value for the WCU parameter is 200. If the parallelLoadThreads parameter is set greater than 1 (default is 0), then the WCU parameter is set to 200 times the parallelLoadThreads value. In the US East (N. Virginia) Region (us-east-1), the largest possible WCU parameter value is 40000. If the AWS Region is us-east-1 and the WCU parameter value is greater than 40000, the WCU parameter value is set to 40000. In AWS Regions other than us-east-1, the largest possible WCU parameter value is 10000. For any AWS Region other than us-east-1, if the WCU parameter value is set greater than 10000 the WCU parameter value is set to 10000. AWS DMS supports migrating data to DynamoDB scalar data types. When migrating from a relational database like Oracle or MySQL to DynamoDB, you might want to restructure how you store this data. Currently AWS DMS supports single table to single table restructuring to DynamoDB scalar type attributes. If you are migrating data into DynamoDB from a relational database table, you take data from a table and reformat it into DynamoDB scalar data type attributes. These attributes can accept data from multiple columns, and you can map a column to an attribute directly. NULL data from the source are ignored on the target. Before you begin to work with a DynamoDB database as a target for AWS DMS, make sure that you create an IAM role. This IAM role should allow AWS DMS to assume and grants access to the DynamoDB tables that are being migrated into. The minimum set of access permissions is shown in the following sample role policy. The role that you use for the migration to DynamoDB must have the following permissions. DynamoDB limits the precision of the Number data type to 38 places. Store all data types with a higher precision as a String. You need to explicitly specify this using the object-mapping feature. Because Amazon DynamoDB doesn't have a Date data type, data using the Date data type are converted to strings. Amazon DynamoDB doesn't allow updates to the primary key attributes. This restriction is important when using ongoing replication with change data capture (CDC) because it can result in unwanted data in the target. Depending on how you have the object mapping, a CDC operation that updates the primary key can do one of two things. It can either fail or insert a new item with the updated primary key and incomplete data. AWS DMS only supports replication of tables with noncomposite primary keys. The exception is if you specify an object mapping for the target table with a custom partition key or sort key, or both. AWS DMS doesn't support LOB data unless it is a CLOB. AWS DMS converts CLOB data into a DynamoDB string when migrating data. AWS DMS uses table-mapping rules to map data from the source to the target DynamoDB table. To map data to a DynamoDB target, you use a type of table-mapping rule called object-mapping. 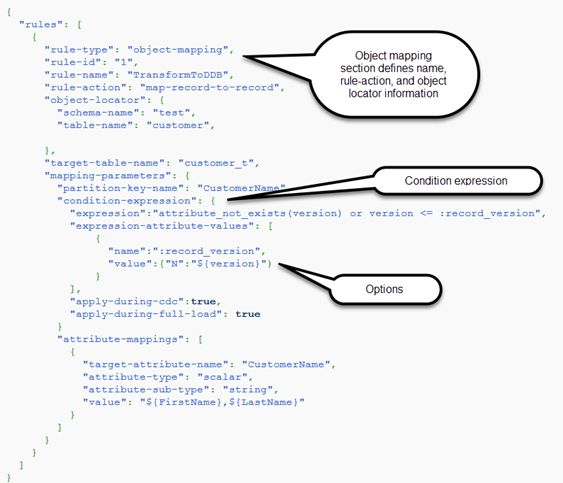 Object mapping lets you define the attribute names and the data to be migrated to them. You must have selection rules when you use object mapping. Amazon DynamoDB doesn't have a preset structure other than having a partition key and an optional sort key. If you have a noncomposite primary key, AWS DMS uses it. If you have a composite primary key or you want to use a sort key, define these keys and the other attributes in your target DynamoDB table. To create an object-mapping rule, you specify the rule-type as object-mapping. This rule specifies what type of object mapping you want to use. AWS DMS currently supports map-record-to-record and map-record-to-document as the only valid values for the rule-action parameter. These values specify what AWS DMS does by default to records that aren't excluded as part of the exclude-columns attribute list. These values don't affect the attribute mappings in any way. You can use map-record-to-record when migrating from a relational database to DynamoDB. It uses the primary key from the relational database as the partition key in Amazon DynamoDB and creates an attribute for each column in the source database. When using map-record-to-record, for any column in the source table not listed in the exclude-columns attribute list, AWS DMS creates a corresponding attribute on the target DynamoDB instance. It does so regardless of whether that source column is used in an attribute mapping. You use map-record-to-document to put source columns into a single, flat DynamoDB map on the target using the attribute name "_doc." When using map-record-to-document, AWS DMS places the data into a single, flat, DynamoDB map attribute on the source. This attribute is called "_doc". This placement applies to any column in the source table not listed in the exclude-columns attribute list. To migrate this information to DynamoDB, you create rules to map the data into a DynamoDB table item. Note the columns listed for the exclude-columns parameter. These columns are not directly mapped over to the target. Instead, attribute mapping is used to combine the data into new items, such as where FirstName and LastName are grouped together to become CustomerName on the DynamoDB target. NickName and income are not excluded. By using the rule-action parameter map-record-to-record, the data for NickName and income are mapped to items of the same name in the DynamoDB target. However, suppose that you use the same rules but change the rule-action parameter to map-record-to-document. 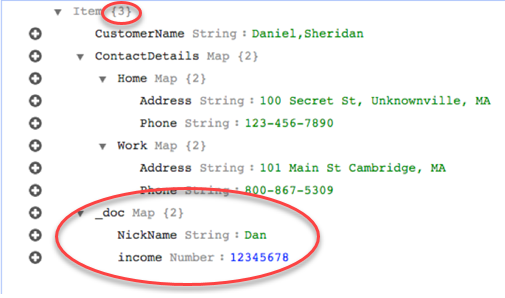 In this case, the columns not listed in the exclude-columns parameter, NickName and income, are mapped to a _doc item. You can use a feature of Amazon DynamoDB called conditional expressions to manipulate data that is being written to a DynamoDB table. For more information about condition expressions in DynamoDB, see Condition Expressions. The following sample highlights the sections used for condition expression. 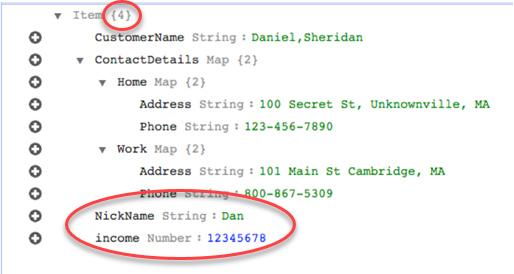 Attribute mapping lets you specify a template string using source column names to restructure data on the target. There is no formatting done other than what the user specifies in the template. The following example shows the structure of the source database and the desired structure of the DynamoDB target. First is shown the structure of the source, in this case an Oracle database, and then the desired structure of the data in DynamoDB. The example concludes with the JSON used to create the desired target structure. Another way to use column mapping is to use DynamoDB format as your document type. The following code example uses dynamodb-map as the attribute-sub-type for attribute mapping. The following example migrates data from two MySQL database tables, nfl_data and sport_team , to two DynamoDB table called NFLTeams and SportTeams. The structure of the tables and the JSON used to map the data from the MySQL database tables to the DynamoDB tables are shown following. The Amazon DynamoDB endpoint for AWS DMS supports most DynamoDB data types. The following table shows the Amazon AWS DMS target data types that are supported when using AWS DMS and the default mapping from AWS DMS data types.